The conventional wisdom is that there are very few hoaxes in the UFO field. Researchers suggest that 90 to 95 percent of all UFO sightings can be explained in the mundane as simple misidentifications of natural phenomena, misidentifications of aircraft or balloons, or as normal things seen under abnormal conditions. Of that 90 or 95 percent, some, maybe as few as two percent are hoaxes, according to the researchers. In fact, Project Blue Book officials suggested that there were so few hoaxes, they didn’t even deserve their own category. The truth of the matter is that there have been major hoaxes in the UFO field from the very beginning in 1947. The reason so few of them have been discussed in the UFO literature is that it is very difficult to call someone a liar in print. When a case is labeled as a hoax, those who tell the story are being called, in essence, liars. Most researcher begin to look for other words and other labels to apply to the case. An alternative, if available, is often used instead of the word hoax. In the UFO field there have been a large number of photographs offered as evidence that we have been visited. Unfortunately, the majority of them seem to have been taken by teenaged boys and most of those are hoaxes. This is a fact that is easily verified by a quick examination of those photographs. 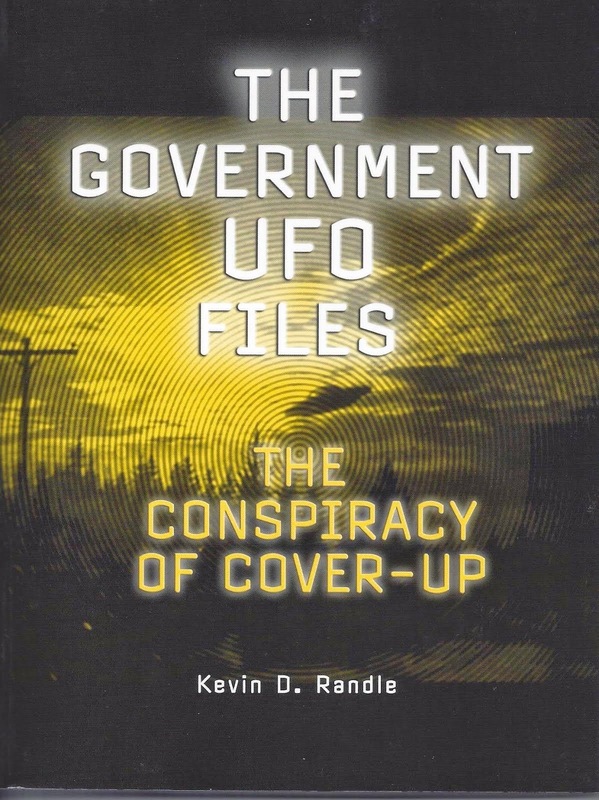 It must be noted, however, that many of the UFO researchers have missed those explanations so that pictures, exposed as hoaxes surface in UFO books, articles, and on television documentaries as if they are legitimate. It is an area that creates confusion in the general public and journalistic communities, and leads those who do not study UFOs, who have a passing interest in them, to believe that there is nothing to them. There is a belief that all of the UFO sighting reports are made by hoaxers, tricksters and pranksters. The 1997 bestseller, The Day After Roswell, by retired Lieutenant Colonel Philip J. Corso is a case in point. Corso claimed that during his long military career, he was exposed to the top-secret files of various governmental agencies dealing with UFOs. Corso claimed to have an intimate insider’s knowledge of what was happening with UFOs, that he had been told about and had seen personally the files about the Roswell UFO crash, and that he could answer the questions about the crash that had plagued researchers since 1947. Corso, however, demonstrated that he didn’t have access to everything and made a mistake that suggested he might not have access to anything. In the photo section of his book, he published a picture of a UFO over some hills in southern California. He noted that he was never able to confirm the veracity of the "UFO surveillance photos" which he had found in Army Intelligence files. If Corso was who he said he was, he should have recognized the picture as a hoax. It had been labeled a hoax in the public arena as early as 1966 and the Project Blue Book files had it listed as a fake. That photograph, according to the editors of a special UFO edition of Look magazine was taken by Guy B. Marquard, Jr. on a mountain road near Riverside, California (Seen on the left). Marquard said that it was a hoax, that he was sorry to disillusion people, but he was 21 years old at the time and was having some fun. Project Blue Book files suggested it was the hub cab to a 1930s Ford thrown into the air. It would seem that if the vast majority of UFO researchers knew the photograph was a hoax, Corso would have known that as well, if he truly was the insider he claimed to be. Instead, as if to prove the point here, Corso reprinted the photograph as if it was something that had stumped the military investigators. But Corso isn’t alone in his belief that certain photographs reveal the presence of extraterrestrial visitors which were later proven to be, admitted to be, or shown to be, hoaxes. In May 1952, professional photographer Ed Keffel was standing on a cliff near Barra Da Tijuca, Brazil when he saw, what he at first believed to be an airplane. The man standing next to him recognized that the craft was something extraordinary and yelled for him to "Shoot! Shoot!" Keffel managed to take five photographs showing an object that was clearly disk shaped with a dome on the top and a raised ring on the bottom. He was lucky that the maneuvers of the UFO revealed it to him from all angles. There was no doubt that what he photographed was not an airplane, balloon, or a natural phenomena. The Brazilian Air Force investigated, tracked down an estimated forty witnesses to the sighting, tried to reproduce the pictures with trick photography, and made diagrams of the sighting on site and of the UFO itself. In the end, according to the report forwarded to the U.S. by Dr. Olavo Fontes of APRO, they found no evidence of a hoax. At APRO Headquarters, the pictures were studie d again. APRO researchers found nothing that suggested hoax to them. The pictures, at this point, were termed to be authentic. The APRO analysis wasn’t the last to be performed. During the University of Colorado study in the late 1960s, the pictures were again analyzed. According to the final report, there was a "glaring internal inconsistency." In the fourth of the five pictures, the object was illuminated from one direction but the trees in the foreground, specifically a palm tree standing above the others, was illuminated from another direction (The photgraph with the palm tree seen on the left). "This is evidence of a hoax unless there were two suns in the sky," according to the University scientists. ARPO responded to the analysis by insisting that they had known about the problem. According to them, blow-ups of the photograph showed that one of the palm branches was broken so that it appeared that the tree’s trunk was in the shade indicating the two suns. If not for the broken branch, the trunk would be in the sun. Everything in the picture would then be consistent and the evidence of a hoax was lost. Even that wasn’t the end of it. People who lived in the area claimed they had seen men with models taking pictures. The Brazilian Air Force suggested that the people had seen Air Force officers attempting to duplicate the pictures. They had not seen Keffel and his companion trying to fake it. As it stands today, it seems that these photographs, once considered among the best ever taken are, in fact, fakes. It is this sort of thing that has plagued UFO researchers from the very beginning of the modern era in 1947. Keffel wasn’t the only man to engage in such a hoax. Paul Villa, Jr. of Albuquerque released a number of photographs that he had taken on June 16, 1963. He provided copies of his photographs to the Air Force for analysis. Not surprisingly, the Air Force concluded that the pictures were of a small model. Captain William L. Turner, Chief of the Air Force Photo Analysis Division wrote in his official report to Project Blue Book, "All photographs have a sky background with an unobstructed view of the object. It seems unlikely that anyone photographing a UFO from several angles would have all good, clear unobstructed photographs of the object." While that might be true, it is also true that Villa might just have been very lucky or even a very good photographer (One of the Villa photographs seen on the left). That, however, doesn’t seem to be the case. Turner wrote, "Photograph #7 shows the UFO at close range with a leafless branch on the left side of the print, passing behind the object. Two twigs from this branch are readily visible on the right side of the object and in good alignment with the main branch. It does not seem possible that these twigs are from the tree on the right which is further away. Therefore, the object is between the branch and the camera. The object is estimated to be 20 inches in diameter and seven inches high." Turner also noticed one other important fact. He wrote, "In photographs #1 and #2 the object appears to be a sharper image than the near and far trees. This indicates the UFO is between the near trees and the camera." Given all that information, it would seem that the Air Force had thoroughly destroyed the credibility of the pictures. The question that has been asked by many is why accept the Air Force conclusions here but reject them in other cases. The answer is simply "Duplication." The Air Force results have been duplicated by UFO researchers and civilian photographic experts. It wasn’t that the Air Force presented a complete analysis but that others, when examining the photographs were able to see the same things Turner saw. The explanation was fair and that is why the Air Force explanation is accepted. There are many other pictures that have been published that we now know to be hoaxes. 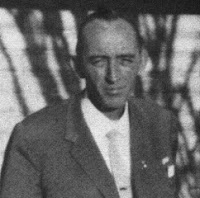 In 1957, for exa mple, Radio Officer T. Fogel claimed to have photographed a UFO near San Pedro, California (Fogel photo seen on the left). He admitted that he had built the object from a model airplane kit. ARPO published a photograph taken in 1963 that showed an object flying beneath an airplane. The shadows of both could be seen on the ground but it turned out to be a hoax. Two teenagers from Lake St. Clair, Michigan created a stir with their photographs of a UFO with an antenna on the rear, but later admitted the pictures to be a hoax. One of the very first of the UFO pictures, taken at a steel mill in Hamilton, Ohio in 1947 is now an admitted hoax. The list could continue until it was pages long. Today, the problem is getting even worse. Before the advent of computers and various software programs that allowed for the manipulation of photographs, it was difficult, but not impossible, to fake good UFO pictures. Something tossed into the air, small models suspended above the ground, objects cut from paper and pasted on the window all contributed to the problem. Analysis by experts could sometimes detect the problems or inconsistencies. It allowed investigators to label a case. If no such inconsistencies were found, it didn’t mean that the photographs showed an extraterrestrial craft, only that it couldn’t be proven to be a hoax. What this meant, simply, was that in the good old days, researchers had a fighting chance. The pictures had to be created physically and mechanically and if they were created in that fashion, there could be something left behind for researchers to find. In today’s environment, such is not the case. Any computer and software program can allow the hoaxer to create a negative that can be examined and on which there will be no evidence of that manipulation. The job just became that much more difficult. This also explains the problem with video tape. It is why we have ignored video taped evidence here. It is just too easy to fake a credible video tape with a good computer and very little in the way of video equipment or even expertise. To prove the point we have created just such a tape, but we made the UFO look more like a worm with windows than anything extraterrestrial. We did it so that there could be no confusion about the origin of this tape. If, however, we submitted it to any of those specializing in the analysis of video tape, they could digitize it, pixelize it, and analyze it any way they wanted, but they would not be able to tell that we had artificially created that tape. We put the appropriate dialogue on it, making it sound as if we were in awe of what we were seeing. We manipulated the object so that it swooped in, passed behind a tree and then disappeared in the distance. The equipment used is not all that expensive, nor is it all that unavailable to the tricksters and the pranksters. Add in the computer software to clean up any problems and then claim tape is the original. No one would be able to tell the difference. The analysis is right back to the credibility of the witness or witnesses. And if they sound sincere, if they have no history of playing jokes and tricks, then there is very little the UFO researcher can do. So, when studying the photographic evidence of visitor spacecraft, we return to those earlier pictures. Could the witnesses have faked them thirty, forty, or fifty years ago? Certainly. But in that time frame the task was more difficult and the evidence for it often showed on the original negatives. That is why, that long ago, investigators, whether Air Force officers or civilian researchers, wanted to see the original negatives. The ideal photographic case would involve multiple witnesses at multiple locations producing both video tape and still pictures. We have often recommended that those with a still camera take a photograph and then move right or left fifty or sixty feet and take a second picture. If possible, the two points from which the pictures were taken should be marked so that precise measurements can be made later by researchers. What this does is allow investigators to make a stereoscopic view of the object which would provide, on the film, important evidence. The altitude, distance from the camera and size of the object could all be deduced from a set of photographs made that way. Now, if there were video tapes of the object, taking by other witnesses in widely separated locations, then corroborative evidence could be collected. It would provide other views of the craft and possibly give additional information about height and speed. It would be a case that would be nearly impossible for the debunkers to destroy because of the physical evidence in the forms of video tapes and stereoscopic pictures. It would end the debate and allow us to move to the next level of investigation. It would seem, given all the cameras in this country, and now all the video tape cameras available that we should have something like this. Since we don’t, it suggests to some that there are no UFOs and spaceships of the visitors. The answer, if we think about it is that real UFO sightings are extremely rare. They are usually close to the ground, no more than at a thousand feet or so. That means that only a limited number of people will see them, if they happen to be looking up. It limits the number of available witnesses and the number of cameras. To argue that meteorites, especially bright ones, are seen by thousands, and they are not only short lived, but also rare, misses the point. The meteorites are usually thirty to forty miles in the air. They can be seen over a wide area. The especially bright ones light the sky drawing attention to themselves. Often there is a roar associated with the bolides that also draws attention to them. The UFOs are most often lower, darker and quieter. Yes, there are a few exceptions, but the vast majority of the cases reflect the lower and quieter component. So, we are left with a rare and low flying phenomena. We are left with photographs, some of which are extremely interesting, but none of which can prove the case. The University of Colorado scientists, when studying the McMinneville, Oregon pictures noted they found no evidence of a hoax, but they also found that the pictures, by themselves, were insufficient to prove that some UFOs were extraterrestrial craft (One of the two photos seen on the left). To us, that seems to be a reasonable conclusion because there could be other explanations that do not require interstellar travel. The fact that we don’t have those explanations doesn’t mean they don’t exist. There might be a natural phenomenon that could account for the pictures. There could be some kind of experimental craft, that never reached production that could account for them. We just don’t know. What we do know, however, is that hoaxes, those admitted by the perpetrators and those discovered by analysis by investigators, have plagued the study of UFOs from the very beginning and beyond. The Great Airship of 1897 seems to have been little more than a fleet of hoaxes launched by those tricksters and liars interested in a good story and a good laugh. Photographic evidence, unless there is a great deal of it from independent witnesses, is never going to provide us with the final solution to the UFO mystery. All they can do is muddy the waters as we learn how many of those photographs were faked by teenagers with too much time on their hands and access to a camera. It seems that nothing has changed since 1897. The people still enjoy a good joke. For those who would like more information about UFO photographs, both real and faked, I have a limited number of Spaceships of the Visitors available for $10.00 (four dollars off the cover price) plus five dollars for shipping and handling (and yes, the postage, envelopes and the like works out to about five bucks). Looking back at many of the columns that I have written for this blog, I am a little disturbed about the negative nature of many of them. I have offered solutions to many sightings, have suggested that some witnesses and researchers are less than reliable, and provided prosaic answers to some of the more interesting mysteries. When I began this, I had envisioned a place where ideas could be discussed calmly and rationally and where we all could search for some of these answers. The problem, I think, is that as we age, our sense of wonder is tempered, if not ruined, by the intrusion of reality. As a young adult, having had the responsibility as a helicopter pilot and a flight lead in Vietnam before I turned twenty, I still had some of that sense of wonder. I believed that mysterious forces were causing ships and airplanes to disappear in the Bermuda Triangle, I thought there was some kind of undefined and undescribed fantastic creature living in Loch Ness, I thought Bigfoot roamed the more desolate areas of the Pacific Northwest, and believed the Allende Letters might actually be a key to understanding UFOs as was claimed by some researchers. But then I read Lawrence Kusche’s book, The Bermuda Triangle Mystery - Solved. I had originally bought it believing in the old adage, "Know Your Enemy." If I was going argue persuasively that various craft really did vanish mysteriously in the Bermuda Triangle, I had to understand the arguments against that theory. Here was one book that flew in the face of all the others. One book that offered a solution, as opposed to all the others that offered more mystery. Imagine m y surprise when I found the answers making sense to me. Ships that weren’t really found drifting and abandoned in the Bermuda Triangle as often claimed. In one case, the ship, alleged to be found without crew and abandoned was recovered in the Pacific Ocean and had nothing to do with the Bermuda Triangle. 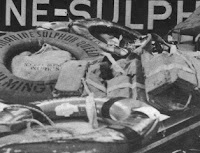 (Wreckage, on the left, from the Marine Sulfur Queen proves it didn't disappear without a trace in the Bermuda Triangle.) That certainly removed it from the rolls of those lost in the Bermuda Triangle. I had the opportunity to investigate one of the aircraft disappearances, but not as an outside researcher, but as an inside intelligence officer. In the late 1970s, I was assigned to the 928th Tactical Airlift Group of the Air Force Reserve. Our parent organization was the 440th Tactical Airlift Wing and one of its C-119s (a similar aircraft seen below and on the left) had disappeared in the Bermuda Triangle without a trace, according to legend (see Disappearing Aircraft - Part 3: The Bermuda Triangle published here in September 2006). 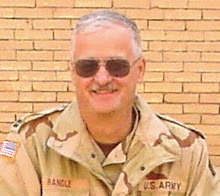 Since I was now a member of that unit, I could ask questions of my counterparts at the higher headquarters that an outsider or reporter might ask and might be ignored if he thought to ask them. We had a conference there, meaning hosted by the parent unit, and in the course of the conversations, I asked, casually, about the aircraft. I was careful, but only because I didn’t know if any of those I asked had been friends with the crew that had been lost. I was told then that the aircraft had a history of electrical problems which is a real clue to what happened. I was told that they were lost at the end of a leg which could mean they were tired and not as sharp as they might have been. And, I was told that the crew had reported electrical problems on that flight, which meant, if they lost electrical power, they would lose their flight instruments, and at night, in the kind of weather they were in, not bad, but hazy, the horizon could disappear, meaning the sky merged with the ocean and without that reference, and without instruments, they could become disoriented and crash. And, I was told that wreckage had been found. The aircraft hadn’t disappeared without a trace. The majority of the aircraft had not been found, but debris identified by serial numbers and markings had been found. This was not a mysterious disappearance, it was a tragic accident that cost the lives of the men involved. Kusche was able to provide other answers by looking at the primary sources. He found that writers of later books reported information from earlier books, apparently assuming that those first writers had reviewed the primary sources. By looking at the primary sources himself, he learned that disappearances often happened in bad weather, or the facts didn’t check out, or that the ship or airplane had not disappeared without a trace. Some wreckage was found. Many of the mysteries of the Triangle were solved that way. Which sort of leads us back to the Warren Smith post not so long ago (See Warren Smith: UFO Investigator or Hoaxster, published here in May, 2007). Smith made up stuff when he needed to add detail or credibility to a story. He seemed to think nothing of this. He thought it was part of doing business as a writer of the unusual and paranormal. If you didn’t have what you needed, why you just invented it. Others, following Smith, then quoted his published work, assuming that some kind of vetting process had taken place. They believed that Smith wouldn’t have made it up and that if the facts didn’t check out, well then, the fact checkers at the publisher would catch them and correct them. The sad truth is that many publishers don’t care what the facts are as long as the book is interesting and the public will buy it. Cash in the pocket is the bottom line and truth has nothing to do with it. Which, I suppose, brings us to some scientific truth. For the Loch Ness monster to be a real, viable creature, there must be more than one. As an anthropology student at the University of Iowa, I was introduced to the concept of a breeding population. This is the number of animals that must exist to keep a population alive and reproducing. If the number falls too low, say under about thirty healthy individuals, then that population is on the verge of extinction. Any minor disaster can wipe them out. A reduction in the food supply, an outbreak of disease, a reduction in the size of the habitat or just encounters with trigger-happy humans. This means that there must be thirty or forty creatures in Loch Ness, not just one. And while I can accept the idea that some kind of huge, bottom dwelling creature in the loch could escape detection, even with all the attempts made to find it, it is not so easy to accept the idea that thirty or forty could have done so. These attempts to find the creature, some of them quite sophisticated and some of them well equipped with the latest technology, should have found something other than rather murky photographs that show something exciting, but only after they have been enhanced. No, in this case, science seems to suggest that there is no Loch Ness monster. If there was, we’d have better data about it. And like so much of the rest of the paranormal world, the best bits of evidence have b een exposed over the years. The surgeon photograph, taken in the 1930s is now an admitted hoax ( seen on the left). There really is no reason to challenge this conclusion given who made it and the circumstances under which he made the claim. Until other, better evidence is presented, we must conclude that there is no monster in Loch Ness. Which is really what we can conclude about Big Foot. Same problems as with Loch Ness. You need a population large enough to breed and a population of that size would leave bigger and better clues than we have. Once again, we do not have the proof necessary. We have some poor photographs. We have hundreds of footprints, many of which were left by people who thought it amusing to confuse the issue. We have some hair samples that do not lead us to conclude that an unknown primate is roaming the Pacific Northwest, but that known creatures are. Which brings us to the Allende Letters, those mysterious documents that so interested the Office of Naval Research back in the late 1950s. The story, as it is usually told, is that a copy of Morris K. Jessup’s The Case for the UFO, apparently annotated by three unidentified, but very knowledgeable men, was received at the Office of Naval Research. Over a period of weeks, a number of letters, obviously written by one or all of those mysterious men, arrived at the home of Jessu p. He turned them over to the ONR. Officers there were so impressed with all this, according to the legend, that they had it duplicated, notations and all, and included the letters in an appendix. The Navy began to investigate the claims in the book and because the Navy was involved, it lent a note of authenticity to the story. The story was a wild one. According to the letters, the Navy, during the Second World War had teleported a ship in an experiment that had something to do with Einstein’s Unified Field Theory. According to Carlos Allende (the man who signed two of the letters, the third was signed by Carl Allen and is seen on the left), the experiment had been a success. The ship was teleported. The sailors, however, were failures. They manifested all sorts of bizarre side effects from their teleportation. In the early 1970s, while I was still on active duty with the Army, and right after I had returned from Vietnam, I learned that one of those involved in the creation of the annotated copy of Jessup’s book., Sidney Sherby, was working for Varo Manufacturing in nearby Arlington, Texas. I called him to arrange an interview. He told me that contrary to the published information, the Navy had not been interested in the Allende Letters or the annotated copy of the book ( a sample page seen on the left). Two of the officers there were (Sherby and a guy named Hoover) and the Navy had no objection to their following up on it as long as it didn’t involve any Navy resources or personnel. In other words, according to Sherby, the Navy had no interest in the matter and the investigation was not Navy sponsored. Then, in the 1970s Carlos Allende appeared at the headquarters of the Aerial Phenomena Research Organization and told the international director, Jim Lorenzen, that the whole thing was a hoax. He’d made it up because the writings of Jessup had scared him. He signed a statement saying that, left a suitcase or two with Lorezen for safe keeping, and left. But in the world of the paranormal, nothing is that easy. Allende surfaced again several years later saying that his claim of hoax had been coerced by, who else, the CIA, and that the story contained in the letters was all true. The CIA had made him claim it was all a hoax. The point here is not to rehash old UFO cases, or to argue for or against some claim of the paranormal, but to examine what we know, and why it continues to recycle. We have good answers for some cases. The mystery has been solved and when we look at the evidence with an open mind and in a dispassionate way we can seen that the answers are correct. I believe that we need to publicize those answers periodically, and we must publicize new answers to old cases as we find them so that we can spend our limited time and resources on the cases that deserve them. I believe that we must publish this "negative" information as we learn it so that our whole inquiry can be advanced. To me, the discovery of an answer for a mystery, the solution to a UFO case is as exciting as the mystery itself. I am delighted that we can look back at the disappearance of the Stardust, an airplane that disappeared without a trace in the late 1940s and say we now know what happened to it. A tragedy for those on board but a mystery that has been solved, in this case, by chance. And, of course, the discovery of the airplane doesn’t answer one of the questions about that. Just what did the word, "STENDIC" mean? (See Disappearing Aircraft - Part 1: Stardust, August 2006). So, sometimes it looks as if this blog is negative, but the truth is, I’m just reporting, as accurately as possible, what I see as the truth, positive or negative. Solutions come at us slowly sometimes, and there are those who truly wish we had no solutions so they ignore them, but it is all part of what we do. Over the course of the last few weeks, British skeptic (or should I say sceptic) Christopher Allen and I have engaged in a discussion of the Roswell case. 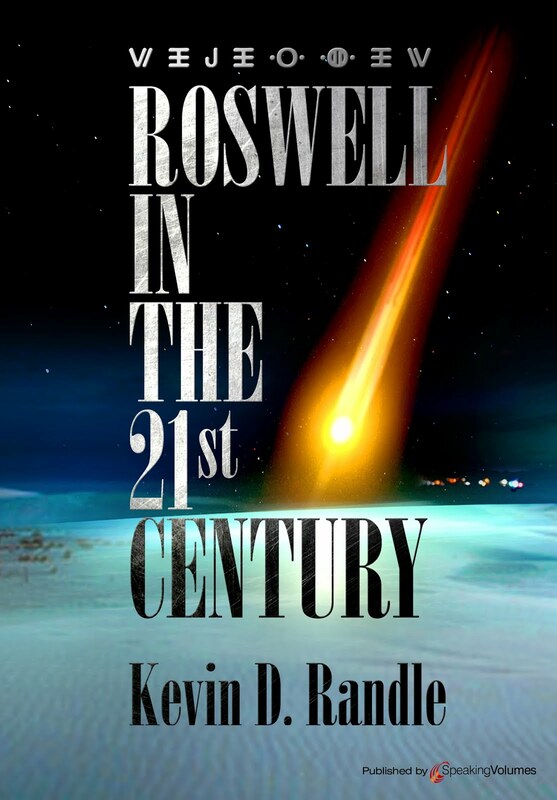 It was sparked by my thoughts on Sheridan Cavitt, the counter- intelligence agent who accompanied Jesse Marcel out to the debris field in the Roswell UFO crash case. I thought it was of sufficient interest, and of a civil tone, that it might be better to move it to a more prominent place here. For those who wish to read the essay that began this, and the other comments about it, see the Saturday, April 28, 2007 blog which can be accessed under the archives. Re: David Rudiak and the Ramey memo; you suggest that Rudiak may be right. I am not going into all the intricate letter-by-letter, word-by-word analysis, as this has been done ad nauseam by others. I will instead give what is known as a 'reductio ad absurdum' answer. If Rudiak is right, this would be the first official document acknowledging an event of momentous importance to the world, namely the discovery of intelligent ET life and its visit to our planet. Therefore there would be (as per my previous posting) several miles deep of official documentation on it, involving the work of countless scientists, committees, institutions, etc etc. As such the GAO would undoubtedly have unearthed this stuff during their searches (which is what they were contracted to do). Since no such documents surfaced and since all the relevant agencies deny the existence of any such documentation, Rudiak is wrong. QED. Nothing more need be said; but I would rate the chance of Rudiak being right on a par with the chance that the CIA murdered Princess Diana. Re: the FBI teletype, again there was no follow-up because there was nothing to follow up. The AF explained it all at Ft Worth, hence the FBI decided there was nothing further to do. There are no inaccuracies in the teletype either, merely a disagreement between those at Ft Worth, who had seen the debris, and those at Wright Patterson who had not (at least not at that point). Had there been a follow-up message, that too ought to have been found by the GAO. The AF were concerned enough about the Arnold sighting to send two officers to interview him, and keep in touch with him. They spent far more time on this case than on Roswell, and there is quite a bit of paperwork on the case. These same officers later died in the plane crash after Maury island (another cover-up of course!). The Mogul answer fits quite well if you go by the 1947 accounts. It is not such a good fit if you go by accounts given 30-50 years afterwards. It has its problems sure, but it is a far better answer than the ET one. (A 60 year ET secret indeed. And not one iota of hardware or paperwork to back it up). Brazel held incommunicado by the military for a week? I just don't believe it. Brazel, and other civilians, never once saying anything about this amazing, extraordinary discovery (if that be what it was) until his death? I don't believe that either. David Rudiak and others are clutching at straws. And that is all they ever will be clutching at. First, let me say that your (CDA) belief in something or disbelief is totally irrelevant. Believe Mack was held by military authorities or don’t, but the fact is that family members other than Bessie say he was. Military men, including Edwin Easley said he was. Friends saw him in Roswell and friends reported that he complained to them about being held in jail when he visited them within days of his release. True, the guest house on the base is not the same thing as a cell in the sheriff’s office, but if you’re not allowed to leave, then it is close enough. Finally, once again, there are the newspaper articles that put him in Roswell on Wednesday so we know, contrary to what Bessie said, her father did return to Roswell. There was no one with him when he died in the early 1960s, so we don’t have a "deathbed" statement about it. We do, however, have a number of his friends telling us that Brazel did complain about his treatment on his return from Roswell. It seems that we run into this belief roadblock of yours all the time and when all else fails, you retreat to the "I don’t believe it" tactic. Second, let me say that I’m not married to Dave Rudiak’s interpretation of the Ramey memo. Clearly some words can be read in memo held by Ramey. Just as clearly there is some wild speculation about many of the other words in it. I have read the various documents about it and even helped design some of the experimentation to check on it (and don’t think that made me a hero in the eyes of the UFO community). While I believe that the evidence in the memo is taken about as far as it can be, and that I doubt we’ll ever have a universally accepted interpretation, there is always the possibility that some sort of breakthrough will allow us to read the memo accurately... and that will be interesting. But now let’s talk about General Exon. Karl Pflock devoted very little in the way to a discussion of Exon, most of that quite dismissive. Philip Klass, in his book, was even more dismissive, never really addressing the testimony, but rejecting it because of what Pflock had to say about it. Pflock’s attempt, Klass’s attempt and your attempt to dismiss what he said as nothing more than rumor and second or third-hand stories is just flat wrong, an attempt to appeal to authority, and certainly not part of a sustained and intelligent dialogue. Exon told me, and he told others, that he had flown over the sites in New Mexico. He gave us the orientation that was correct, meaning northwest to southeast. He talked of seeing markings on the ground that include the gouge and then vehicle tracks. If correct, then Mogul is eliminated because Mogul wouldn’t gouge the ground (as Charles Moore told me personally) and there wouldn’t have been two sites. This then, would be first-hand testimony. And I point out, that unlike some others who have been dismissive of Exon (Pflock interviewed him on the telephone once), I met him in person at the Wright-Patterson Air Force Base, as well as interviewed him on the telephone. But here’s the total of what Pflock said on page 124, " When first made public in 1991, it seemed Exon’s memories of the possibility that the bodies had been flown from Roswell to Wright Field in 1947 might be based on firsthand information. If so, this would be highly significant, especially since Exon also seemed to have firsthand knowledge of the debris field and crash site, as well as a shadowy high-level group established to keep the truth about Roswell under wraps. However, in a lengthy September 1992 telephone conversation, Exon told me his comments about bodies and debris at Wright Field were based solely upon rumors he heard from colleagues at Wright Field and nothing more. As for the ‘control group,’ he said he was merely making educated guesses as to who likely would have been selected for such a group. Finally, with respect to his all alleged knowledge of the debris and crash sites, he told me he remembered flying over several sites in New Mexico quite some time after July 1947, on missions having nothing to do with the Roswell incident. One such location might have fit what he had been told about the crash site by ufologists because it had vehicle tracks running to it." That’s all that Pflock has to say about Exon. He references a personal telephone call to Exon, provides nothing in the way of transcripts or tape of that conversation, and then dismisses the testimony as irrelevant and unimportant. Exon didn’t see anything first hand. Exon heard rumors. Exon didn’t fly over the crash site... well, maybe he did, but it was later and it might not have been the right place. But we don’t have to rely, in my case, on my impressions of what Exon said in private telephone calls that can be filtered through my belief structures. I have the tapes, have published quotes in my books on Roswell, and Exon even said the quotes were accurate. Remember that point. Exon said the quotes were accurate. Exon wrote to me, "Further, you both [Don Schmitt and I] likely recall on many occasions during my visits with you in person and on the phone [please note the phrase, "on many occasions during my visits with you in person and on the phone," which means more than an undocumented telephone conversation offered by Pflock] ...that I did not know anything firsthand. Although I believe you did quote me accurately, I do believe that in your writings you gave more credence and impression of personal and direct knowledge that [sic] my recordings would indicate on their own! I felt that throughout the portions where my name was used." Please note he didn’t like the weight I assigned his statements, but that’s an editorial choice on my part and it in no way compromises the validity of the quotes... "I believe you did quote me accurately." So, then what did Exon say even if we just take everything and label it as second hand? Exon talked about Roswell debris being flown to Wright-Patterson. "The boys who tested it," Exon said, "said it was very unusual....It had them pretty puzzled." Here an Air Force general, even if he's only giving his general impression of what he's heard about Roswell, says the same things about the Roswell debris as some of the controversial first-hand witnesses do. If you put any weight on Exon's impressions, the Mogul theory takes a big hit which might be why we now have to reduce Exon’s testimony to alleged rumor. Also remember that Exon said, "The metal and material was unknown to anyone I talked to. Whatever they found, I never heard what the results were. A couple of guys thought it might be Russian but the overall consensus was that the pieces were from space." Here’s what we learn from Exon quotes (which Pflock ignores in his book, and which the Air Force ignores in their latest Roswell investigation), (a) that Exon certainly thought he knew quite a bit (even if not first hand) about the subjects he was quoted on, that (b) he says quite clearly that he'd talked to people who were involved first-hand, and (c) "Most of the people you're talking to are a little bit like me. Close enough to know that there was something happening. They had no direct responsibility for any of it." Here’s what Exon said, which is far beyond anything Pflock discussed in his book. You might also want to ask yourself why the Air Force didn’t interview Exon. They certainly could have because he was alive during their investigation and I gave them his telephone number and address (as if they couldn’t have found that themselves). Then, rather than interview some civilians 9like those working on Project Mogul) who had no real knowledge of the Roswell case, they could have talked to one of their own and gotten his impressions... not to mention the taped (video and audio) with other officers who were involved, which they didn’t bother to do. 2. He said he knew that debris from the crash was studied at Wright-Patterson, and that the debris was extremely unusual. His description matches that of alleged first-hand witnesses and moves it away from Mogul. 3. He said that "apparently" there were bodies found, and that they were located at "another location," or in other words not at the location of the metallic debris. The main body of the craft, he said, was also found there. 4. He said the bodies were taken to Wright-Patterson. He said that one was taken to Denver because the Army had a mortuary service there. 5. He said he flew over the Roswell crash site, and saw the "gouge" the crashed object made in the ground. 6. He said there was a coverup. In fact, he called it (on the tape) "a national coverup project." Is all of this remarkable? Of course it is. An Air Force general, whose assignment at Wright-Patterson suggests he might have been in a position to know what he was talking about, says, in great detail, that he thinks the Roswell crash was real. Yet, you wish to ignore this testimony and rely on the very little that Pflock offered in the way of evidence for his position on the Exon testimony. Believe or disbelief, the problem here is that Exon was at Wright Field in 1947, he had first-hand knowledge, he talked to people involved in the research, and when questions about the validity of the quotes were raised, Exon verified that they were accurate. Philip Klass is even more dismissive than Pflock, reducing mention of Exon to a footnote and the claim that Exon was engaging in gossip (or to be accurate, just telling rumors he had heard... rumor being defined as an unverified or unfounded report, story, etc., circulating from person to person). Exon was clear that his information came from specific people who were the ones who conducted the testing on the debris and who were involved in the retrieval and preservation of the bodies of the aliens. Kal Korff was even worse, misinterpreting Exon’s statements and cherry picking the information to fit his preconceived notions. But the real point is that Exon provided both first and second-hand testimony, based his statements on what he had observed himself and provided by officers he trusted, and who, when push came to shove, verified the accuracy of the quotes I attributed to him. Roswell UFO Crash Update ($10.00) (in which is information about Frank Kaufmann that is now horribly out of date, which is to say, inaccurate).